macOS Server 5.2 (for Sierra) sees no changes with the FTP Service from previous versions of OS X. Instead of sharing out each directory the new incantation of the FTP service allows administrators to share a single directory out. This directory can be any share that has previously been configured in the File Sharing service or a website configured in the Websites service. To setup FTP, first open the Server app and then click on the FTP service. Once open, use the Share: drop-down list to select a share that already exists (output of sharing -l basically) and click on one of the shares or Custom to create a new share for FTP. 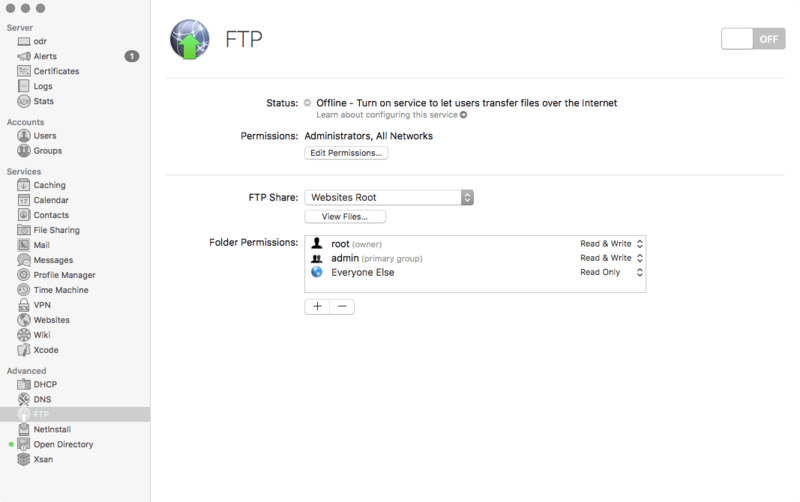 Then, set the permissions as appropriate on the share and hit the ON button for the FTP service. Now, let’s test from a client. I like to use the ftp command line interface built into OS X. To test, type ftp followed by the address of the site (and I like to put the username followed by @ before the hostname, as follows: ftp robin@sierraserver.krypted.lan When prompted, provide a password. Then, assuming your get the following, you’re in: 230 User robin logged in. Amiga was so powerful that I began on Mac OS with a virtualization app (http://shapeshifter.cebix.net), it was faster than any Mac with the same processor, I was on A3000. Mac OS was for entering PAO business. Thanks for your big macOS Sierra Server Tour, i’m waiting for eventual tips on how customize Apache config, how to keep then. I am hoping you can help me resolve a maddening problem. I am trying to get FTP running on my 5.2 server. IF I try connecting to localhost, or the machine’s LAN IP, it works, but if I try using my WAN hostname it fails. The issue is not DNS because all my other services work fine. Any help would be much appreciated. if telnet failed you should look at your router configuration, ftp should be difficult to pass router… it depends the router. Thank you for getting back to me. Unfortunately, though I attempted your suggestions, I’m not entirely sure how to interpret the results. Is there any way we could communicate via e-mail so I can send you detailed descriptions of what is happening?